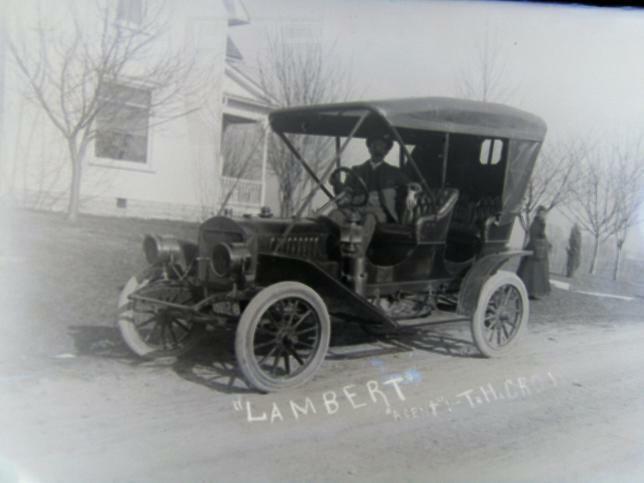 Model T Ford Forum: OT...1908 Lambert. Need any information that can be found. 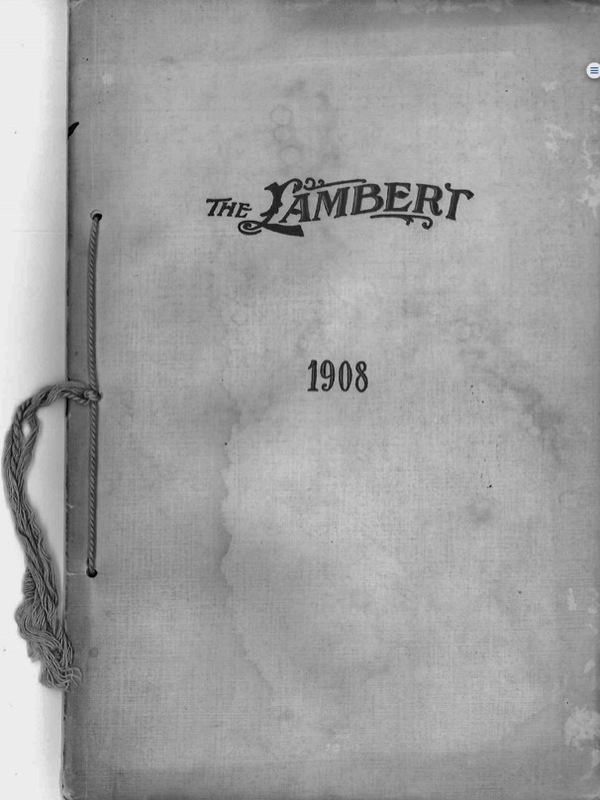 OT...1908 Lambert. Need any information that can be found. 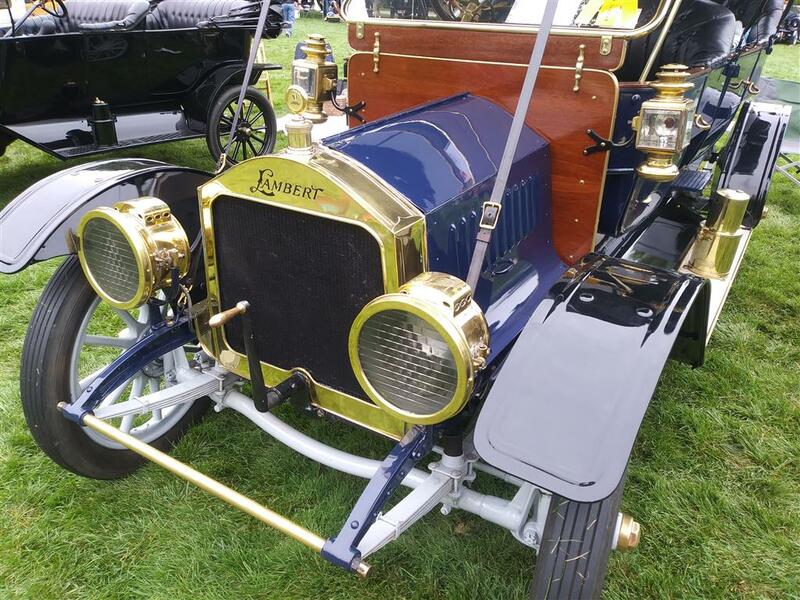 Model T Ford Forum: Forum 2018: OT...1908 Lambert. Need any information that can be found. 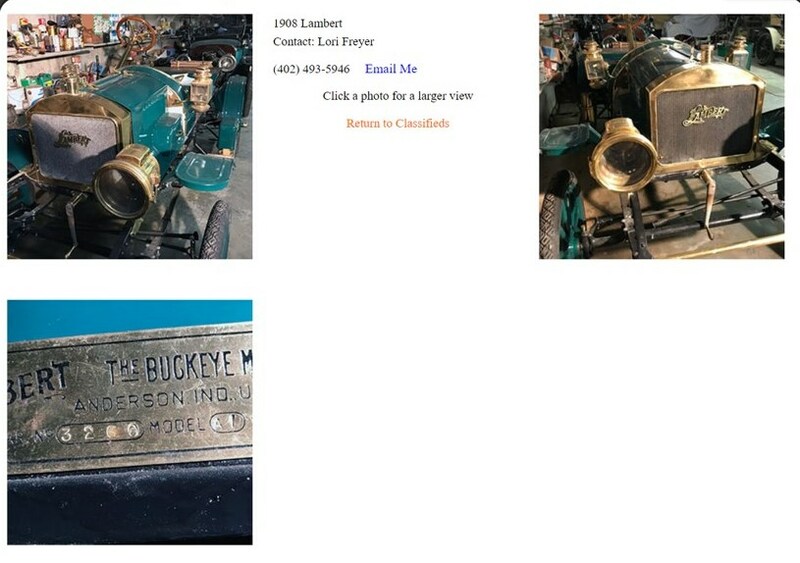 If anyone out there has any information or better yet pictures of a 1908 Lambert it would greatly help with its restoration. For example the original shape of the hood, etc. Thank you!! If you are a member of AACA, you can contact the library. That is a great resource. Dan, I was down there and saw these cars. 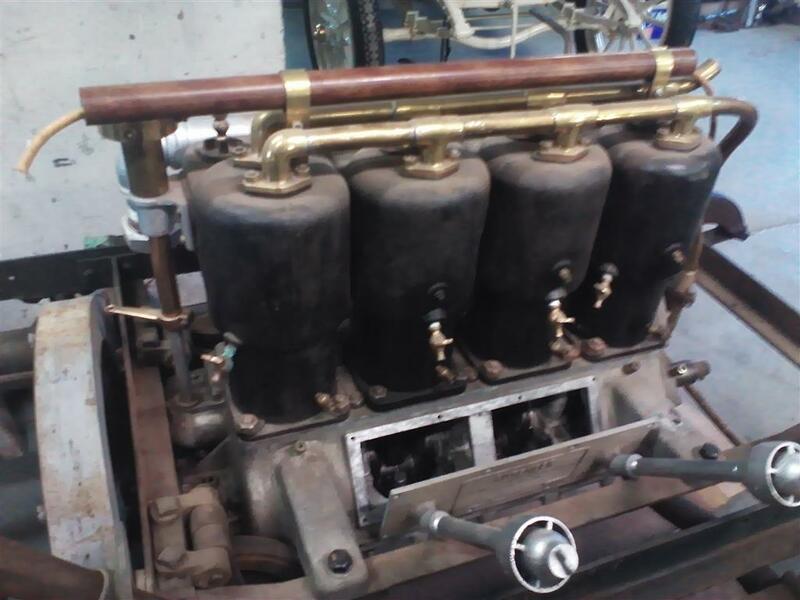 A friend bought the Buick Model F they had. All I thought was these cars need to get out of this basement! Good luck with the project thats a great one! Dean I won't be doing the resto on this one. Its way out of my league. A friend will be receiving it shortly and he really needs the details of the hood and splash aprons. They will be made from scratch. Rob thank you for the book info. It may be a required purchase. I have googled the car but was hoping to get some closer detail on the body parts. Gotta love the way you guys jump in to help. I can't think of any other group so willing to take the time for others. Thank you all !! 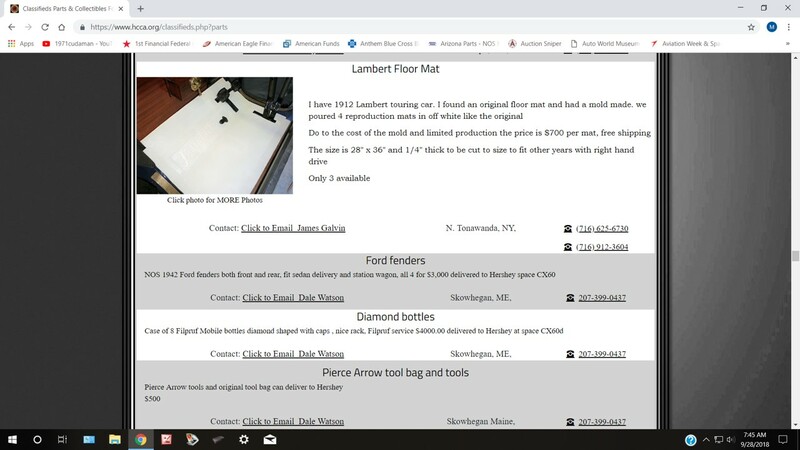 The estate of Terry Lambert is selling some Lambert and other cars on the HCCA classifieds, there might be some useful pictures there. Mark its weird that the same parts are missing on that one also. Thanks for the posting. I was just informed that the splash aprons are not a problem but the hood is still a mystery. Don - it's not weird because it appears to be the same car. Don arn't the car at top and Marks post the same car? Yes, they are the same car. Especially note the non-factory eagle mascot on the radiator cap. Well the color shows up much better in the HCCT pictures. And I couldn't tell if that was a round radiator on the pic's I posted. They should mark that one sold...thank guys. What horsepower is that one? What a nice project. Denny has worked on a lot of different big brass cars in your area he maybe helpful. Nice guy too. Congrats on the Lambert. Saw it one on the HCCA site and thought, Wow, what an amazing automobile. 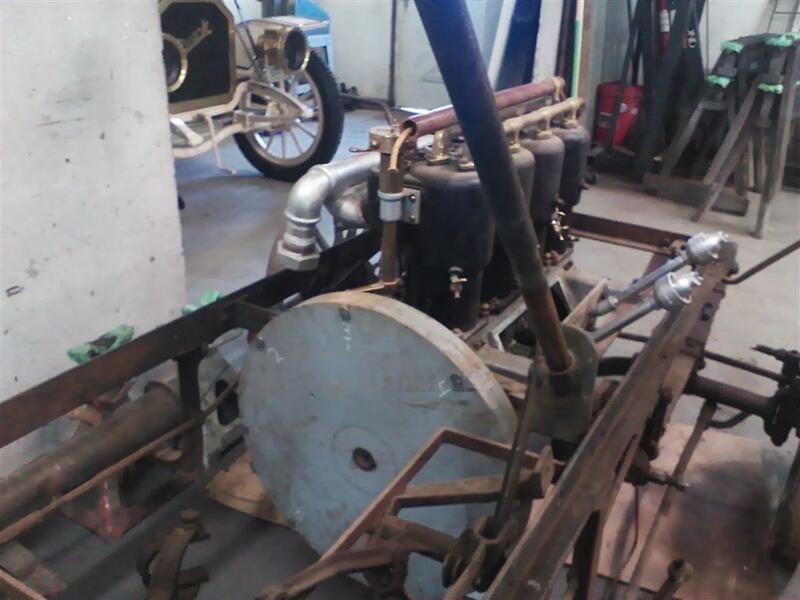 I own a friction drive cyclecar, but much smaller in size. Haven't driven it yet, nor have I ever had the chance to drive a friction trans. car. Looking forward to seeing how well it works when I'm up and running. Hope to be seeing updates from you on this one. Please keep us posted. Hood shouldn't be to bad to fab. Horizontal hood, 4-piece, 3-piano style hinges, fit to the radiator in front and hood former in back. From drawings you can questamate the hinge height locations, then figure out what it looks like at the hood sills, probably rolled up into a bead. Hood latches might take a bit to find some with the right look and some sheet metal shaping for the latch locations. Looks like a great project, would be hard decision to restore or just polish up the way it is and make mechanically sound and drive it. 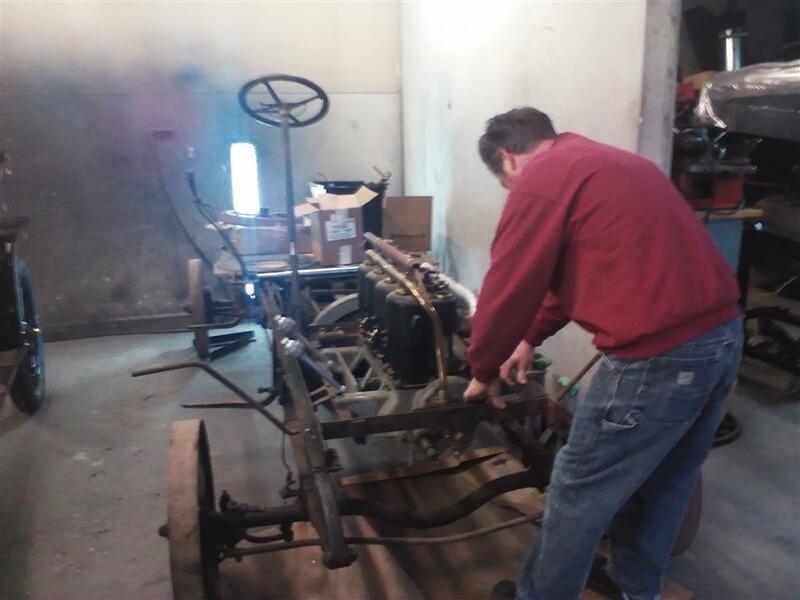 Dad and I own a friction drive car to but a lot smaller a 1911 Metz Plan car. Ours is a two cylinder. It�s about 95% complete. We are having a body currently built good luck and keep the pictures coming! I looked at that Lambert on the HCCA classified site a couple weeks ago. I found myself really wishing I could try to buy any one of several of those cars from his collection. This one I think intrigued me the most because of its size. Lambert built quite an assortment of cars in sizes from high wheel to small standard configuration on up to rather large cars. There were a lot of friction drive cars back in those years. Most of them inexpensive, low end products with limited appeal. 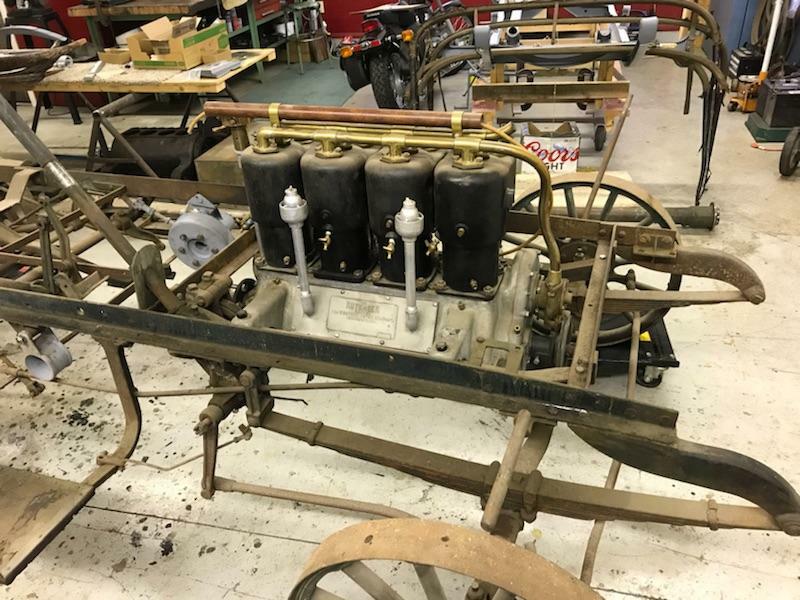 The Cartercar and Metz are best known for friction drive in horseless carriage circles. 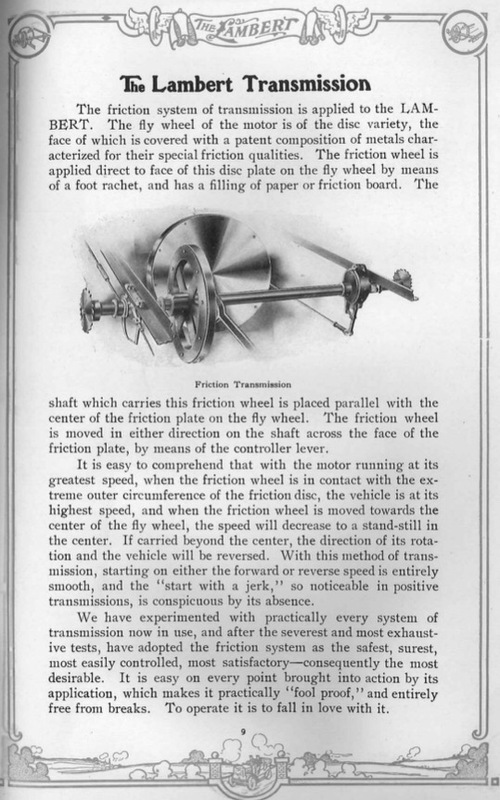 However a lot of highwheel types were friction drive including the Sears Autobuggy. Also several of the cyclecars of the mid-'10s used friction drive. 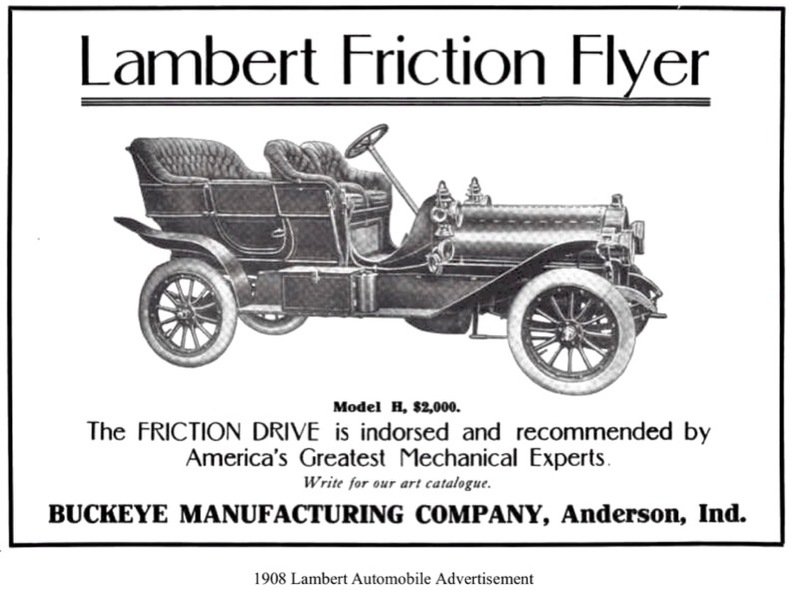 Cartercar and Lambert probably built the largest and best of the friction drive cars in those days. I have been up close with a few Cartercars, and spoken with several owners of them. They were well built and fairly large (for the era) cars. Had Carter not suffered an untimely death, it is entirely possible that the friction drive could have become as normal as the gear-shift. Carter had the dream, and the drive to alter the path that became history. When he died, his family sold the young company they had no desire to continue to the forming General Motors. GM continued to build cars for several years using Carter's designs. However, GM did little to promote the ideas or the marque. Some historians believe that the Cartercar purchase was simply one of convenience and short-term profits for the struggling GM. Carter's ideas conflicted with patents GM held and had Carter's ideas caught on with the public? They would have threatened cheaper alternatives for competitors to get into the business. After a few years, GM rolled the factories and other assets into other GM products. 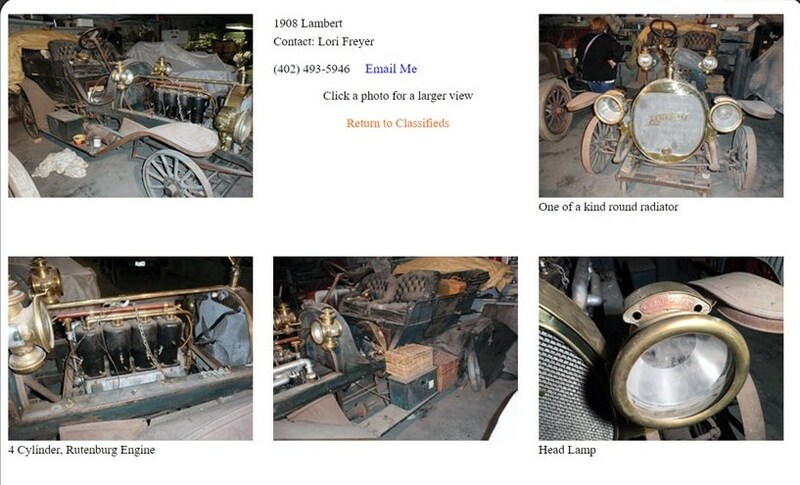 While Lambert is less remembered in the antique automobile hobby, they too built some fine cars. All this has me thinking back and wondering? I wonder if Brent in ten-uh-see is still out there lurking near this forum? I wonder what became of the early friction drive chassis he had acquired? And if he ever positively identified it? Maybe it could have been a Lambert? The hood for this car should not be too big of a problem. Even a few original era photos or ads should yield a few clues. Build something that fits the space, and keeping within the techniques and styles of the day (not hard to figure out), and one should be fine. It is not like you will find yourself near another one anytime soon to compare it with! As for level of restoration? That is a tough one. The car as a whole is a bit far gone for true preservation, although the body appears good enough to consider. I would think the answer lies in how much is known about the car's history. Just how much of what is there is known to be from a single original car? Condition of parts varies quite a bit. If he assembled this from the remains of a couple different incomplete cars? Then I would say a full quality restoration would be in order. Lets see it as it was originally intended. If it is basically one original car? I don't know if those fenders can be made to look nice enough to belong with that body (it looks good!). And then one would need to make a new hood look like it belongs. A tough call indeed. The previous collector clearly had an interest in Lambert (his name for those that hadn't noticed), and likely was THE expert authority on the subject. I still wish I could somehow get one of those cars! Robs link shows some really good photos and line drawings of the friction drive parts. 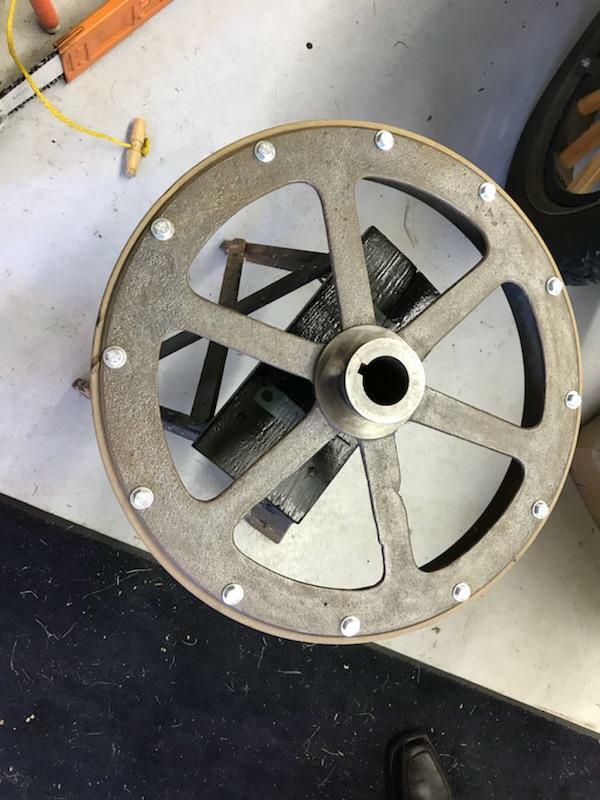 Unusual wheel, no provision for rings to hold tire; help, info, or rims greatly appreciated. Thanks Wayne, just want to make a honest effort to get it as correct as possible. The books that Rob posted looks like the best bet. I hope to get better detailed pictures of it soon. I'm sure there will be many more questions for the experts. Thanks everybody!! I know this is a forum for Fords but many here have such vast knowledge of the era auto's, just want to pick their brains without upsetting anyone. Looks to me like the hood has a outward flare where the latches are...what are your thoughts? Richard is there a information source for the Fisk bolt on? Thank you for your response .. This is what I found on a quick search^. Does not look the same re the metal ring on the wheel. Wow, that's a great picture and break down. I'm not sure what we will have until the car shows up. But thank you Mark this may be something that can be used for duplication. Thanks !! 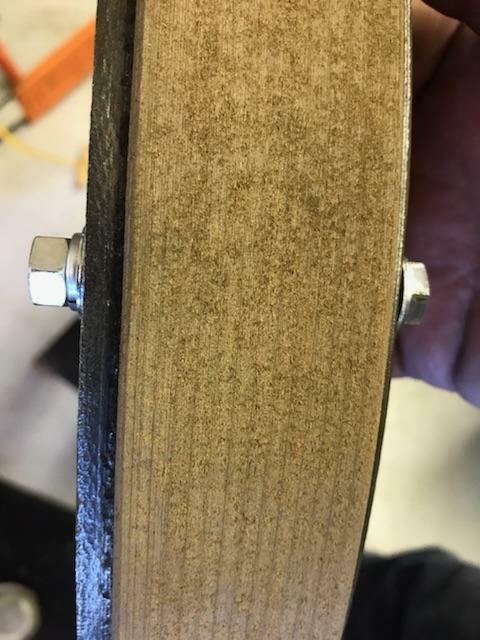 While I was looking, I was thinking, maybe because how rare this setup might be, you could re-wood the wheels and use a more normal clincher rim instead. OR depending on size, mount and substitute clincher rims. I'm getting a huge response on Facebook from all over the world. It looks quite hopeful that the correct setup may be obtainable. There is actually a Lambert group meeting/show today and the owner is on his way to it. Should be interesting to see what comes of it. Thanks to everyone for taking the time to respond!! 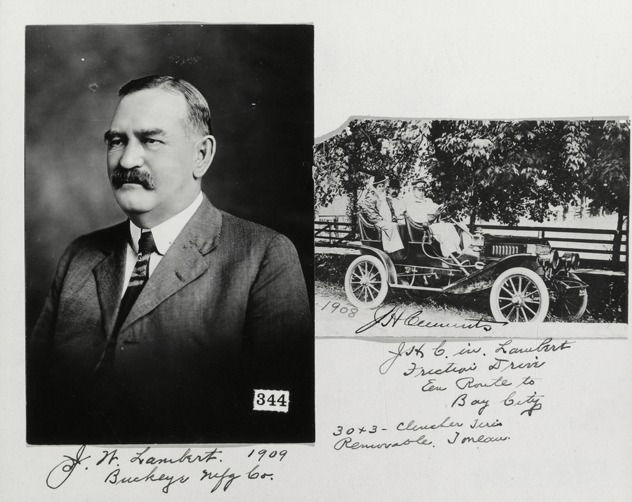 Portrait of John W. Lambert and view of Lambert and two passengers posing in a Lambert car. Handwritten on front: "J.W. Lambert, 1909. Buckeye Mfg. Co. J.H. [undecipherable], 1908. J.H.C. in Lambert friction drive en route to Bay City. 30 + 3 clincher ... Ain't this a special !! The owner just filled us in on the Lambert Auto Reunion yesterday. They congratulated him on owning the ONLY 40hp Lambert in the world. The ONLY shaft drive Lambert in the world. The ONLY large touring Lambert in the world. 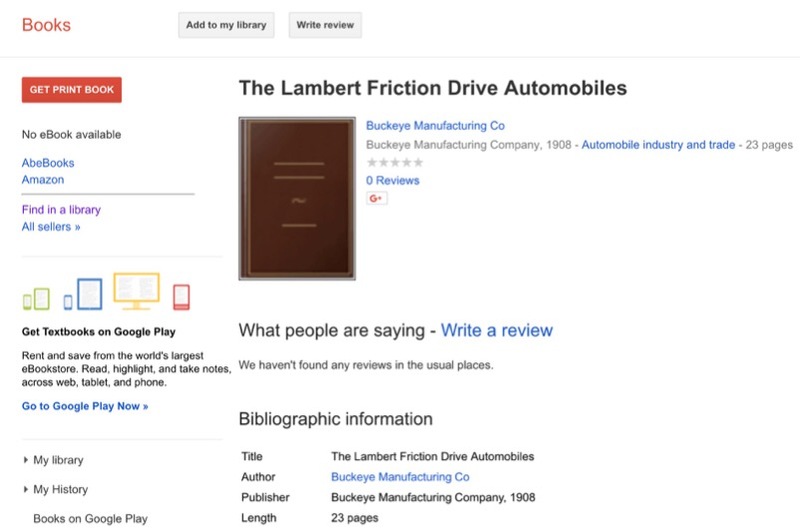 The Smithsonian's Lambert does NOT exist. So I'm think'n it may be a bit difficult to find much reference for this project. 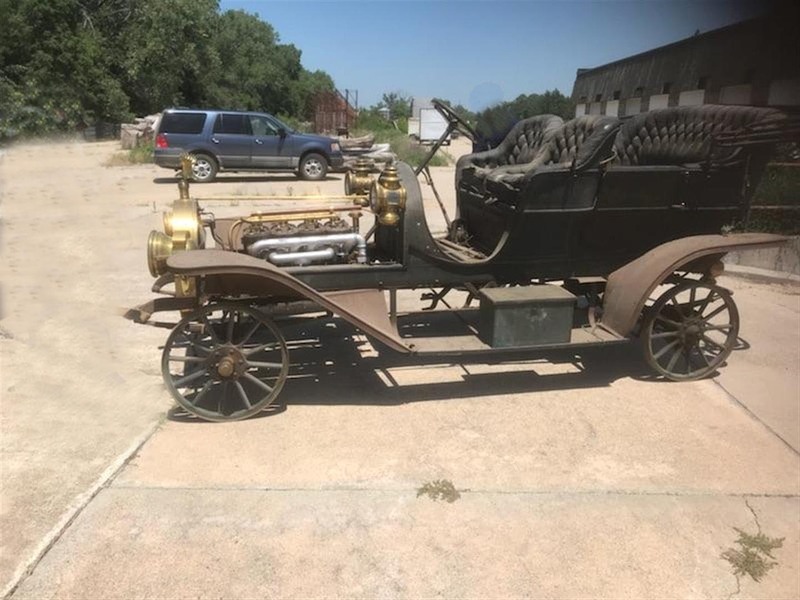 A reality not spoken about too often in the Horseless Carriage crowd, is that a lot of Horseless Carriages do not have correct wheels on them. This is a reality that goes back to the beginning of the hobby. Tires were simply NOT available for most early cars. To this day, only certain more common sizes and types remain readily available. 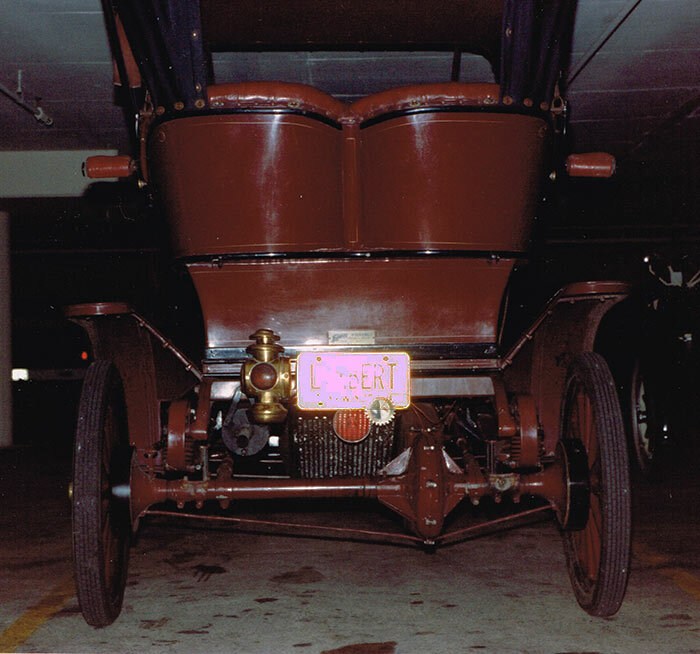 When I had my series 80 Pierce arrow, I had to wait nearly two years for a limited purchase of four new tires (it was a limited run, and even getting extras was frowned upon because other people were waiting). And it wasn't that rare, nor anywhere near this early. It seems like such a simple problem today. We have more than a hundred years of development to look back upon. However, in those early years, they did not have the materials, manufacturing techniques, or proven designs to work with. Cars were getting bigger fast. Wheel bases and body weights were growing each year. 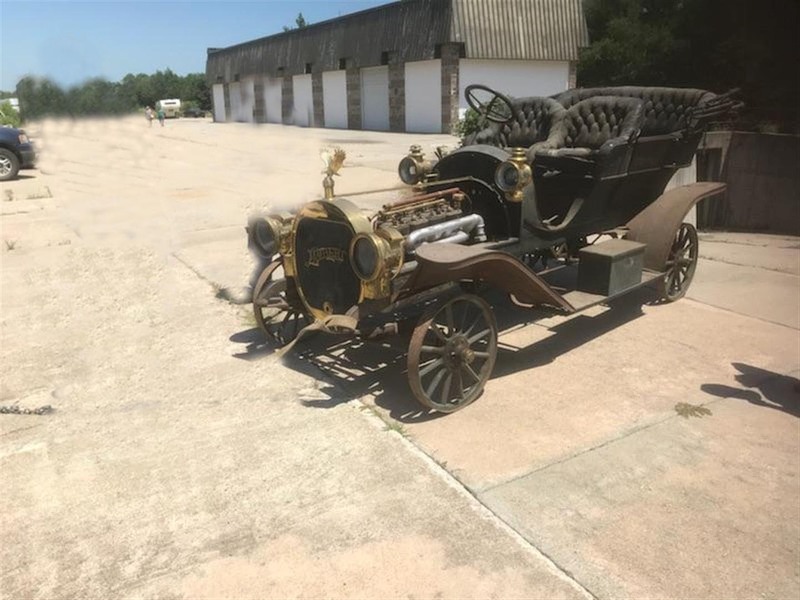 A friend of mine has a 1906 Locomobile. It was one of the larger cars of 1906. Yet, today, park it along with a bunch of 1910 to '12s at a major HCCA meet? It will likely be one of the smaller cars (although one of the most incredible looking cars!). 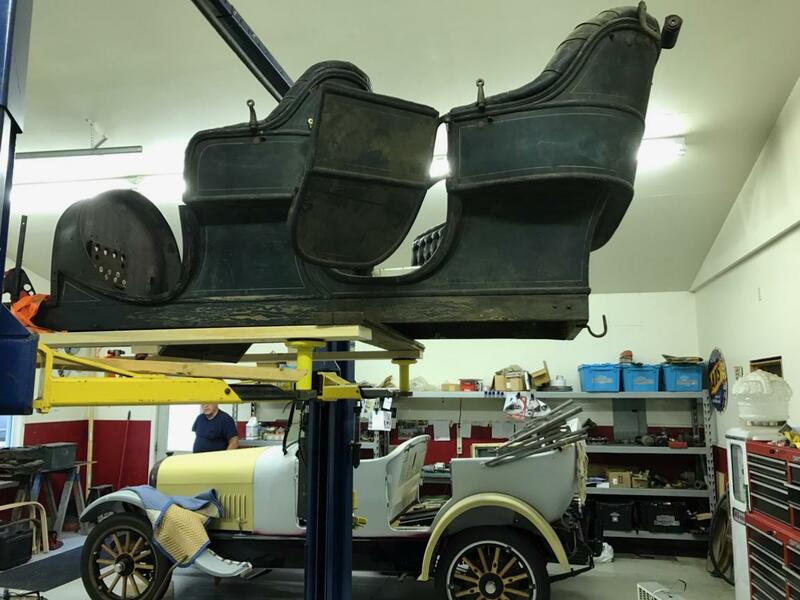 The wheelbase of a Rolls Royce in 1904 was only 75 inches (I just looked it up!). Speeds being driven were also getting faster FAST! One of the biggest problems faced by automotive designers in those days was "How to keep the tires on the car?" 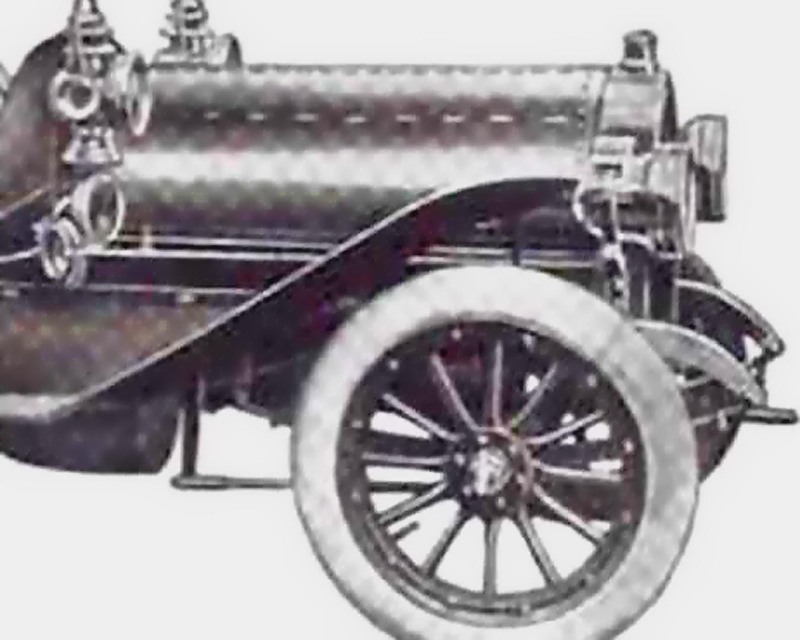 Before 1910, there were about a dozen schemes to mount and hold flimsy tires on heavy cars. 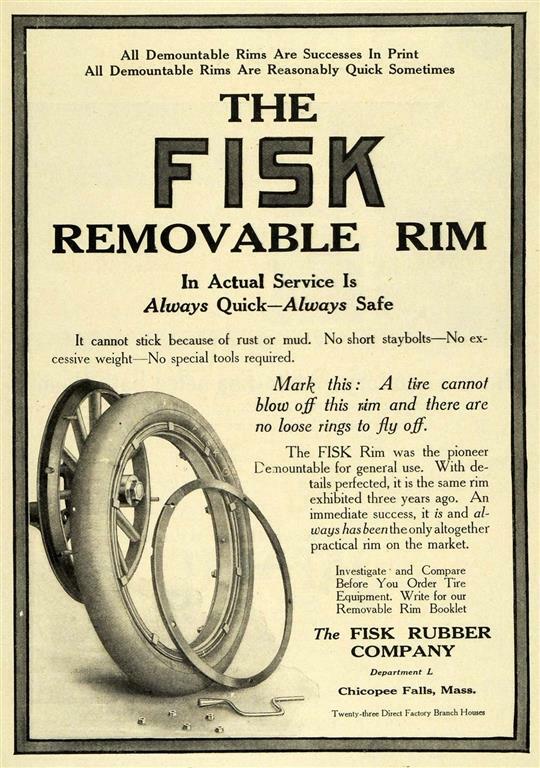 Many of them required special tires made specifically for that particular wheel design. Even Ford offered (if I recall correctly) three different wheel types for the NRS cars (one was the Fisk design). This has been discussed before here, Rob H could probably enlighten us here better than I ever could). There were several methods used to bolt tires directly onto the wheel, as well as clamps that held the tire from the inside. Others had a bunch of bolts lined up around the felloe attempting to build the rim around the tire. Some ideas may have worked okay, but were a pain in the wazzoo to repair a flat. Others were fast and easy, but often flipped the tire off on its own or in other ways created the flat for you to fix. I have seen many designs, some on cars, others at swap meets or in friend's garages. Some I have only seen pictures of. I have never (not even inside my own head) tried to make any study of them (although I think it would be very interesting!). All that leads up to a simple reality. Sometimes, the best option is to replace/alter, modify the wheels to an appropriately size available tire. The hobby has been doing that since its beginning in the 1920s. 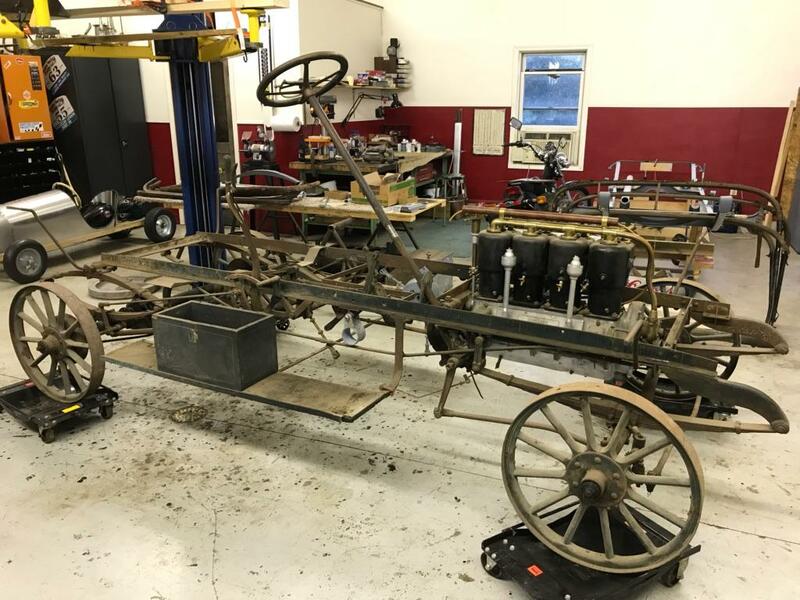 Thousands of prized Horseless Carriages have wheels not correct for them. And many of their current owners do not even know. 33X4 and 34X4 straightside are fairly common Horseless Carriage tire sizes. They would not be technically correct for a Lambert (probably? ), but may be a good option for new wheels. I am fairly sure new rims are available for those sizes. If I recall correctly, I believe Ed's Locomobile has 33X4 on it. The size may be right for that Lambert (I would need to measure the wheels to speculate there?). It would just be the rim type that would be different. Wayne, When I posted my comment about doing about the same thing I had never heard of it being done. Thanks for that info. 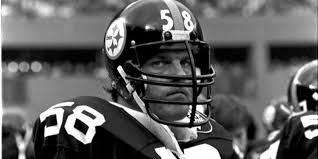 Why not ask Jack Lambert? 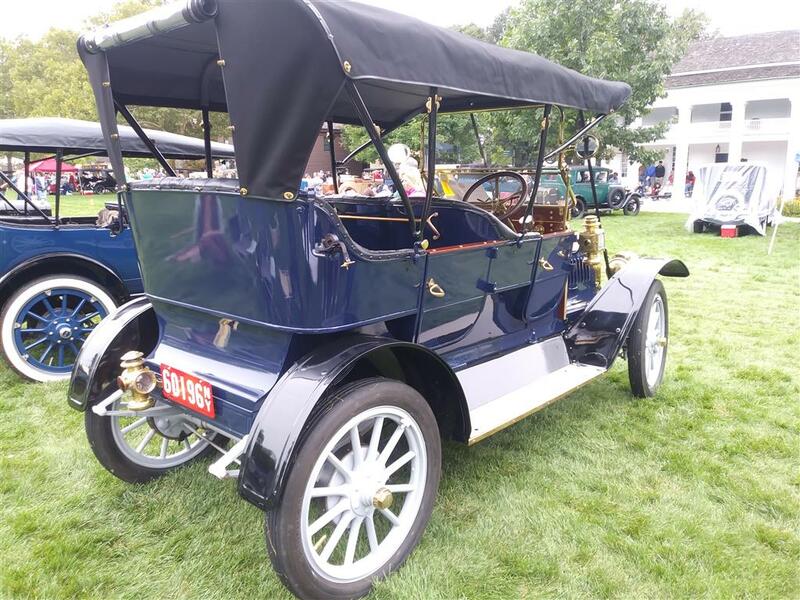 I believe that the 1907 Model H and the 1908 Model M were basically the same car and were the only shaft drive Lambert cars. 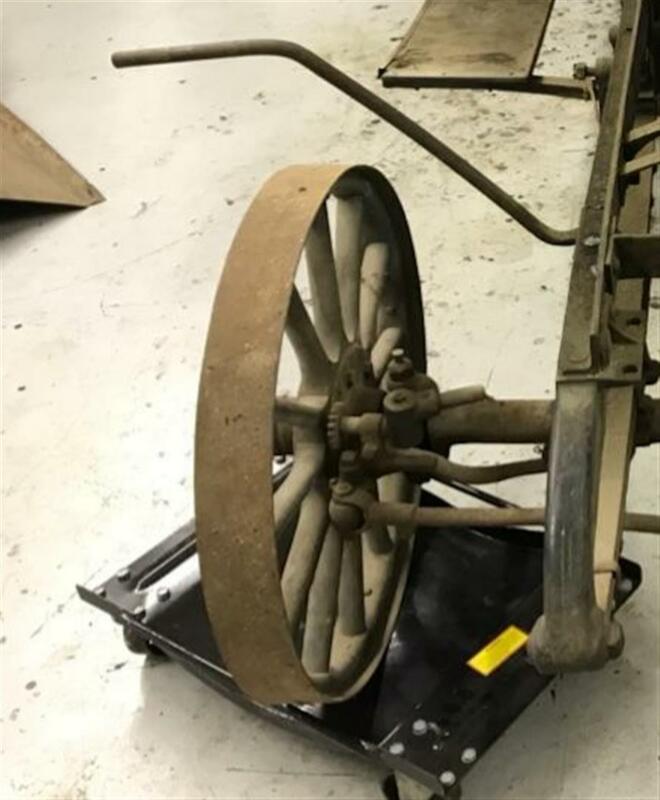 Both were listed as having 32" wheels and I believe it was stated that the 1907 32" wheels had 32x3-1/2 tires. Here is a teaser. A poor scan of an original period picture of the Lambert that I picked up some time ago and hung on the wall. The original picture is clear enough to see the pin stripes. It also shows the Fisk demountable wheels and that the running board splash aprons are fabric and not steel. It didn't fit my home scanner well. I'll have to take it into work to get a higher quality scan. OMG !! That is huge! Jeff we may have to have a talk. I am going to PM you. Thanks so much for posting. John, thank you for posting the spec's every little bit helps. And to all that have contributed you will have a slice of this restoration and know that its very much appreciated. THANK YOU ALL !! Keith, thank you for the picture of the hood. It may be closer to the original than we know..thx again !! Don't try to scan the whole photo. Take digital photos of the details. Sorry for the delay. I think I'll have a scan of the book by the end of today. Do you mind if I put a few pages of it up on this thread? I'll send you a copy and link when I receive it. I sent this link and photos on to Don, and he said I could post them here too. All rights apply to the Indiana Historical Society. It looks like a Snapper mower! 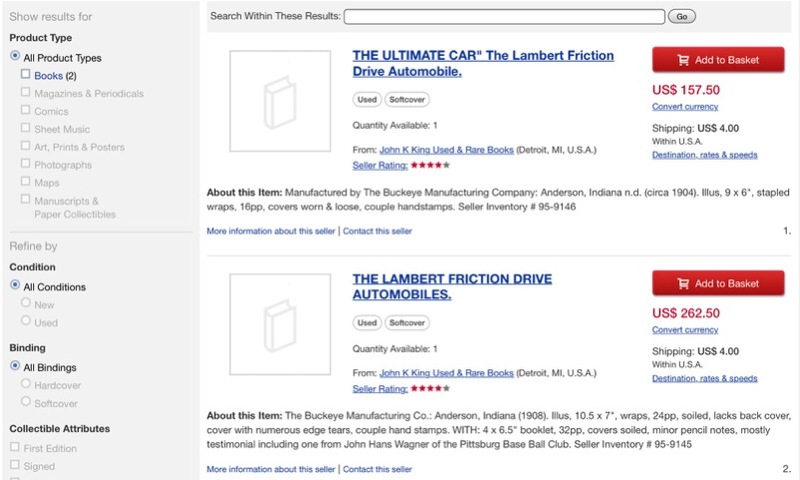 I recently purchased both books written by John Lambert's great granddaughter where she makes the case for her great grandfather being the first person in the U.S. to attempt to market a gasoline car. Fascinating reading! 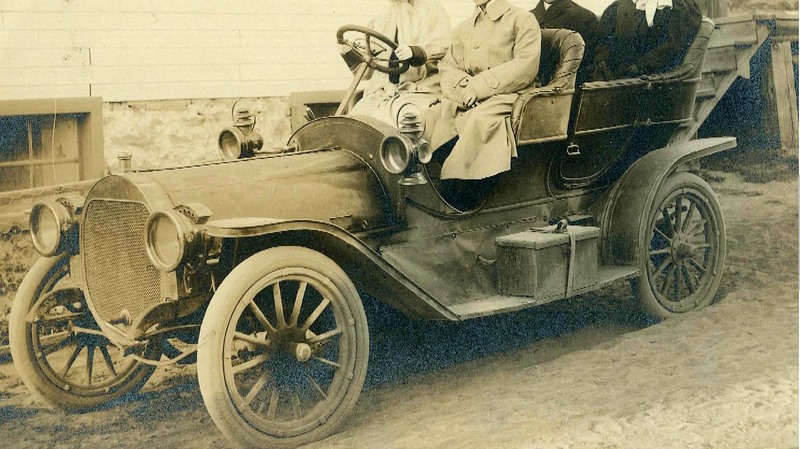 Apparently Ellwood Haynes visited Mr. Lambert and secured a promise from him that he would not contest Hayne's (incorrect) claim to have created the first gasoline automobile. Rob firstly, thank you for taking the time to research this. Secondly, I can't think of a better person to help shed light on such a mystical period of the past. It's inconceivable that this much information would be freely shared if not for the common interest of those on this forum. I hope to photo document the revival of this Lambert and unless the owner says otherwise, that is what I will do. The entire forum community will have helped and I hope they have a smile for doing so...thanks so much !! Rob - thank you so much for the scan/link. Don, my pleasure. 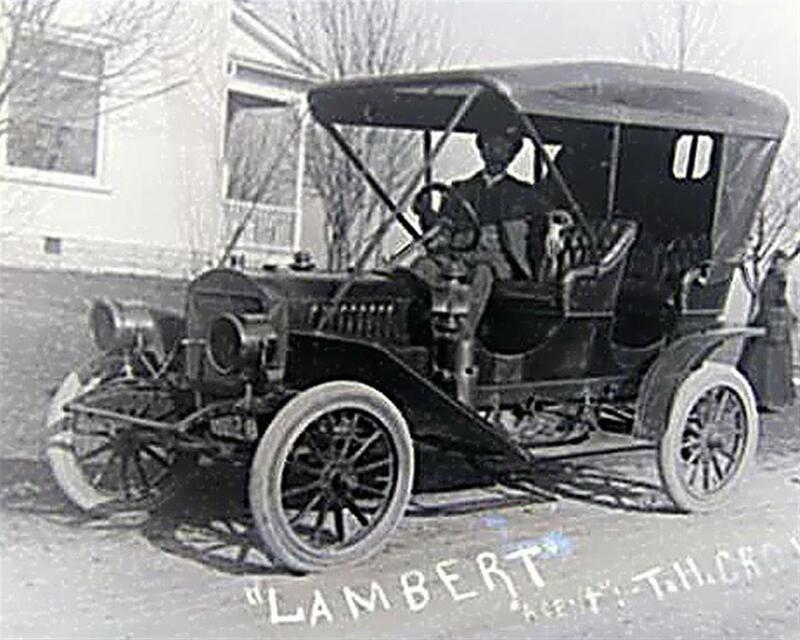 The Lambert, like so many other early marquees, took a unique approach to a common problem, transferring power from the engine to the wheels. 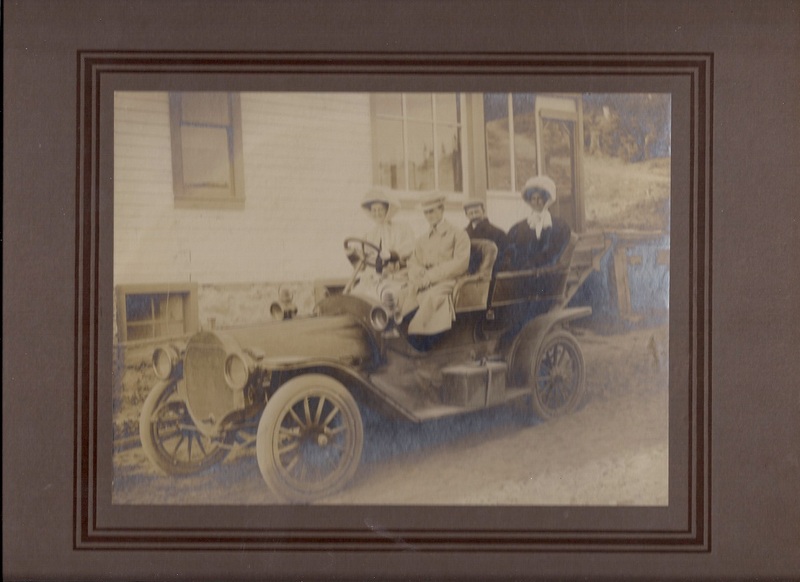 Thank you for sharing the photos of such an interesting early automobile. 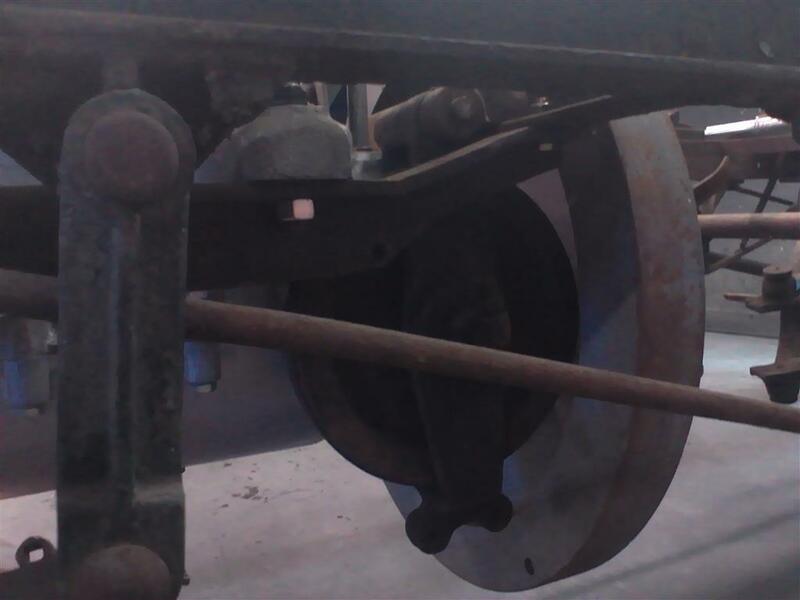 Here is a little better picture of the Model M.
Question for you friction drive experts. The original material was some type of pressed paper used for the clutch material. What are you guys using now days? There has to be a more durable way to go...thanks in advance for all the help!! Don't know about the paper thing, but it's hard to imagine all that car and only an angle iron frame. if you haven't yet I would ask on one(or more) of the antique car forums too, like HCCA etc. Maybe check with some Metz or Cartercar owners? 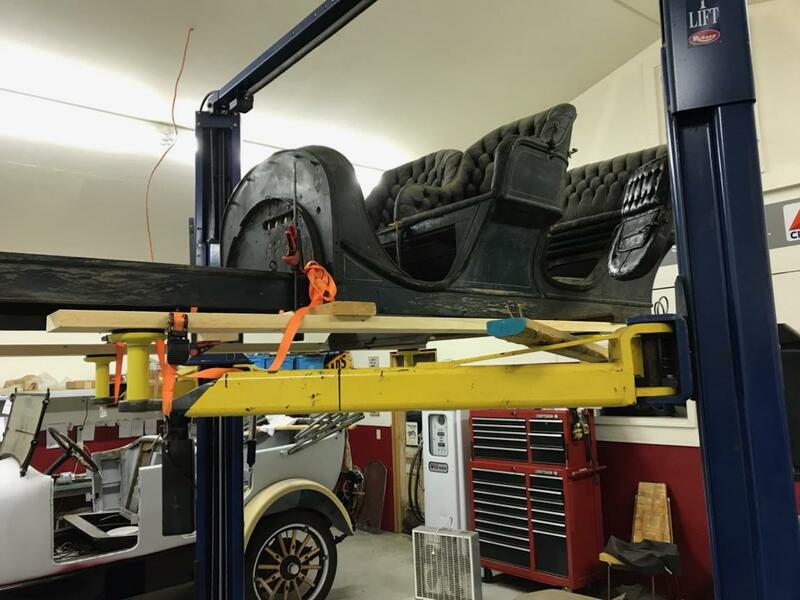 The company that originally made the friction material for the Cartercar is still in business, but under a different name, see the last link below. Mark Strange!! Thank you so much!..The "paperpulley" website has the exact same wheel as this Lambert. I can't say thanks enough for your help. This was googled to no avail but the worries are over. Mark Gregush, the body has a hefty 3" X 5" wood frame that's bolted into the angle iron. 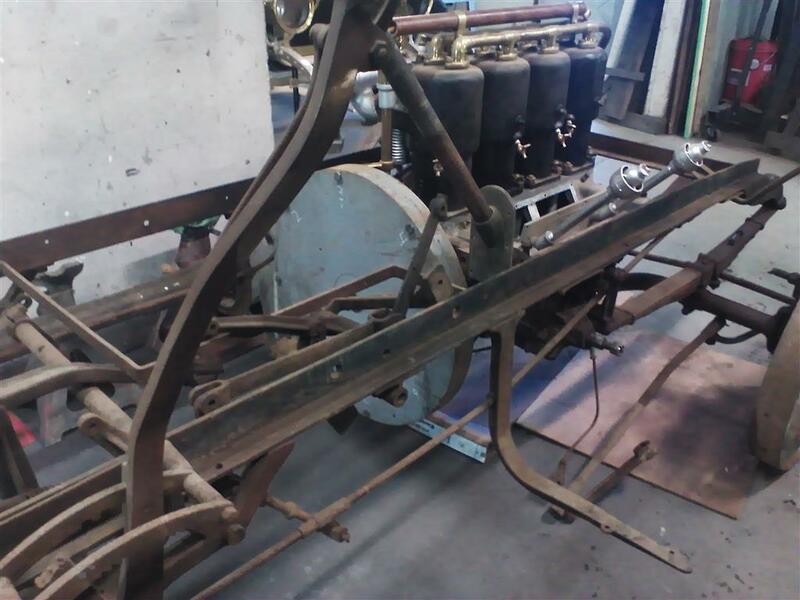 But Franklin at that time period was using all wood for the chassis frame. Interesting stuff !! Thanks for your input. Kevlar is used by some on cone clutches. Long wearing and holds up against heat, it maybe an alternative to consider? Thank you Rob, Mark. I think the owner has that pulley in the mail already. He was very excited to find that website Mark. Here is a photo of the flywheel on this beast. I am enjoying all the pictures. I talked to the parties involved and have gotten permission to catalog its revival. But the truth is reviving a one-of-kind wouldn't be possible without the input from the kind people of this forum. I don't have the knowledge of much else than a Fordor or two (or four ). So here we go! Note the upholstery on the inside of the door. Fancy dan ! Don, please keep updating the progress on this. I was another interested buyer, but way beyond my skill set. Sorry for the "negative" image. I know there's editing stuff that can make it look right, but I don't have that anymore. 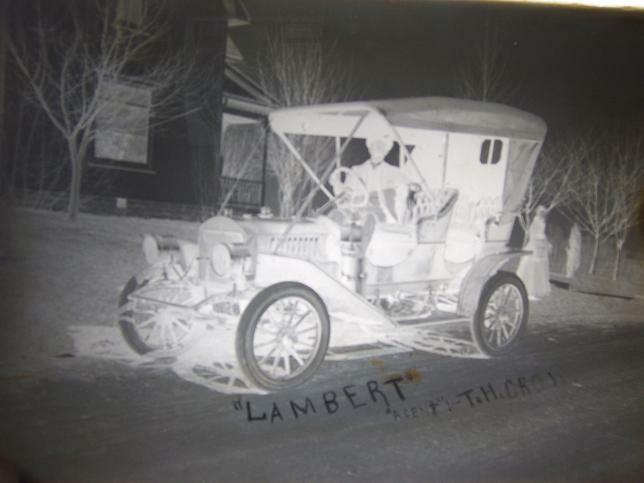 I know nothing of Lambert's but Mr. Lambert who was the previous owner of that car was a life long friend of my grandfather. They use to go to the Hershey swap meet together for many years. The pictures in the first post brought back memories as I know exactly where that building is in Omaha. It's rumored that when my grandfather past away some of his model t parts ended up in that building. I guess it's water under the bridge now. Those Engine Breathers look to be almost identical to the ones found on NRS Fords. Jerry I could be wrong but that looks like a picture of the Lambert Model R. Very cool! Thanks for sharing. This is all fantastic! Thanks to all involved. And, please, continue to share photos etc. FWIW I believe this 2-cyl Lambert car was on the 1982 Glidden Tour in Salt Lake City. The man who had it there was named Lambert, either John or Jack. By the way, thanks Rob and others for the info links. They were wonderful. The HCCA Gazette Vol. 55 No. 6 (Nov/Dec 1993) has some good Lambert articles and information. 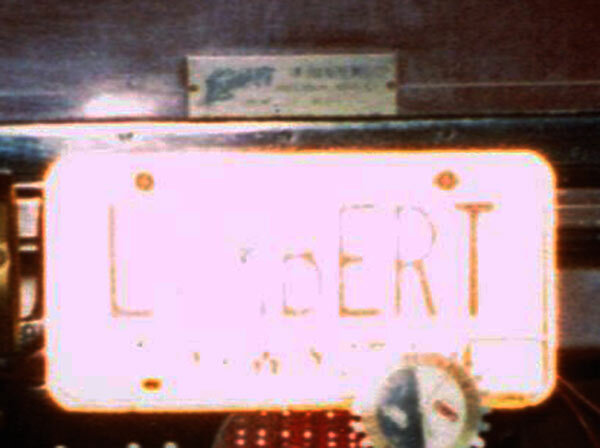 A front view of an "H" and mention of a John Lambert and his 1909 from NY appear there. I believe the latter is the photo I posted above. Need some help finding a matching door handle. 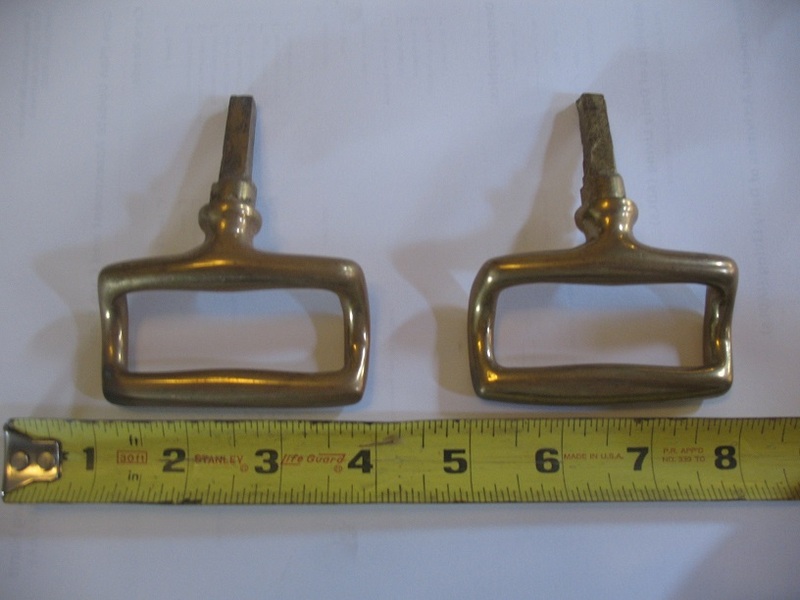 I've been told that these handles were used on several models of the day. Any lead would be greatly appreciated. Thank you !! Good luck finding a match to that handle Don. If not, matching handle and bezel can be easily cast in yellow brass. Boy they sure do look identical....I'm not sure of the shaft length on the lambert but that could be remedied. Thanks Harold !! What does the latch look like? 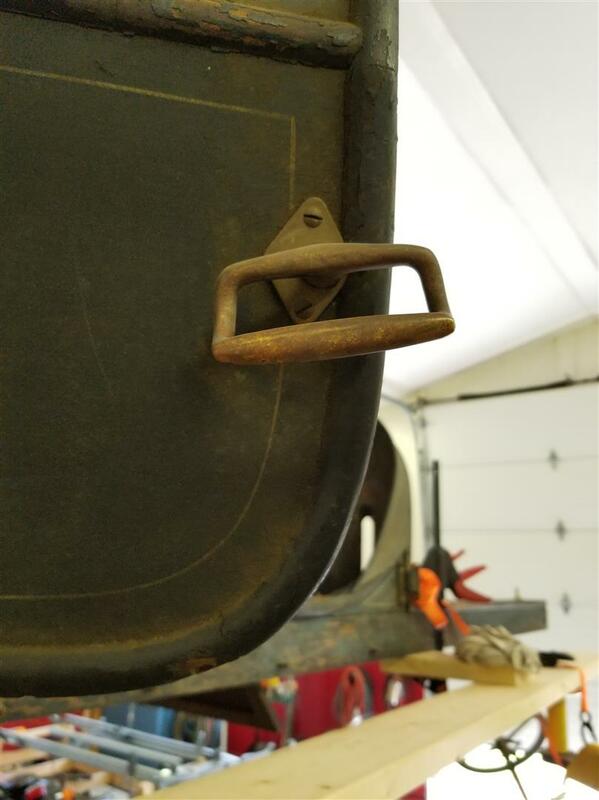 I have an extra REO door handle and latch. Chris, this is the picture I have of the latch. If ok with you I would like to PM you for some more information. Thank you !! If anyone is willing to sell the above handles please pm me. Still looking for one but will buy a pair if need be. Thanks again. Well the restoration has officially begun. The paper pulley has been restored by the same company that made it 108 years ago. That just amazes me.. This is the freakiest hobby one could imagine !! I'd like to thank Mark Strange for providing the website for PaperPulleys. The pulley was sent out the same day you posted it. Thank you very, very much !! 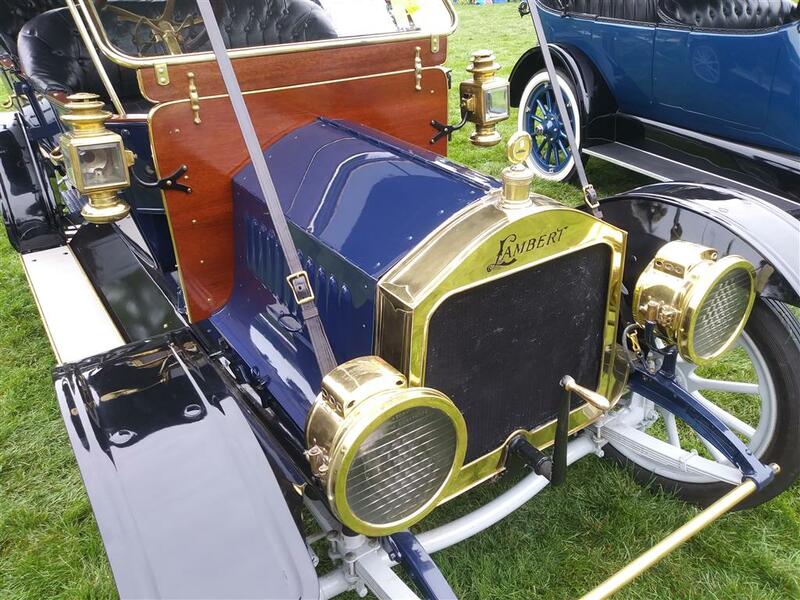 Did you see the 1908 Lambert Touring that was in the judging area at the OCF? Willis, I didn't go this year. But my buddy Ed took some great pictures of it. We will be using them for reference on this build. 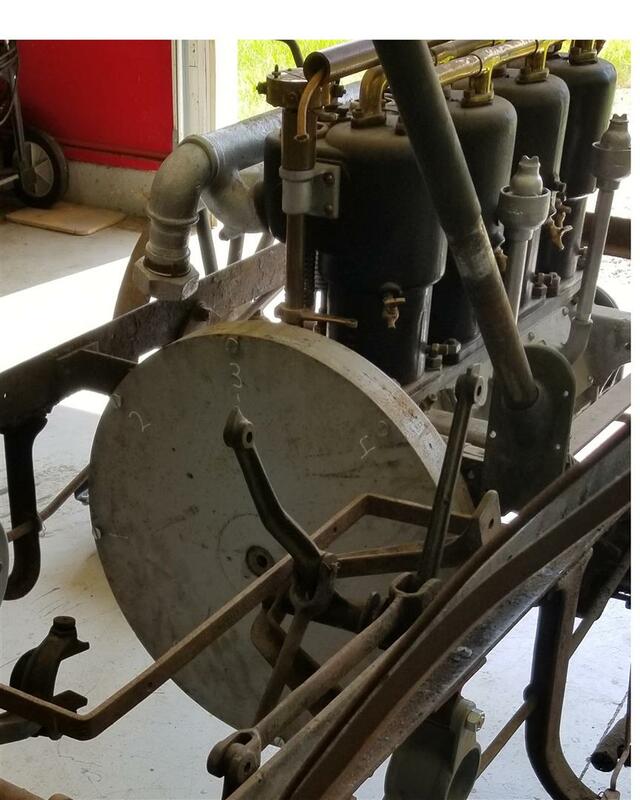 That was a 1912 so close but no cigar for the Model M.
Interesting idea to use a toothed belt final drive instead of the original chain. Oh, sorry, I thought it was an �08. I must have confused it with another car, I saw so many! Thanks for setting me straight. It's been many years since i have seen any but i think that was a Morse Silent Chain? Bud. I'm a Metz owner. Friction car drivers have tried various materials to replace the paper/cardboard pulley, including rubber flat-beltig, kevlar, leather, etc., but paper still seems to work best. This drive system is still used in snow blowers, oil rigs and various other machines. As originally noted by Metz: "No clutch to slip, no gears to strip." That is the car. I saw it too! 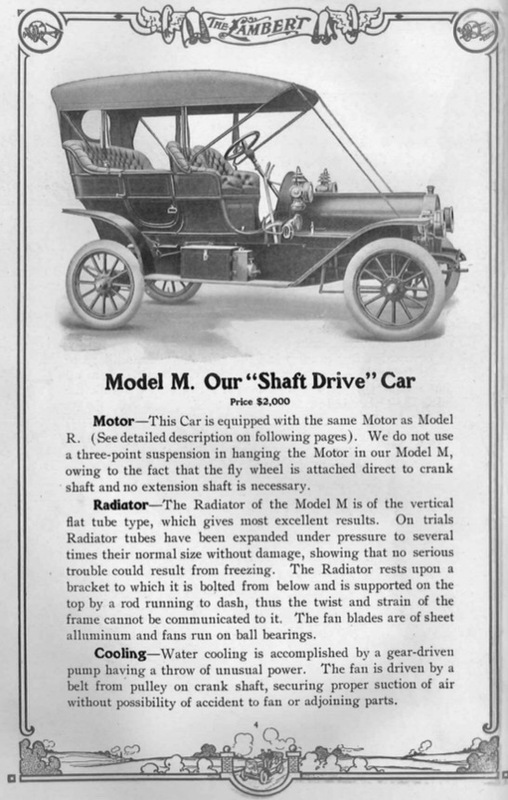 Of particular interest of the 1912 is the flared out hood. We are leaning towards the idea the 1908 hood was shaped similarly. The picture that Jeff (of Nova Scotia) sent, hints towards the same design. However, its very hard to tell. Anyone have thoughts on this? Thanks in advance everyone. Getting this restoration correct is going to be a challenge. 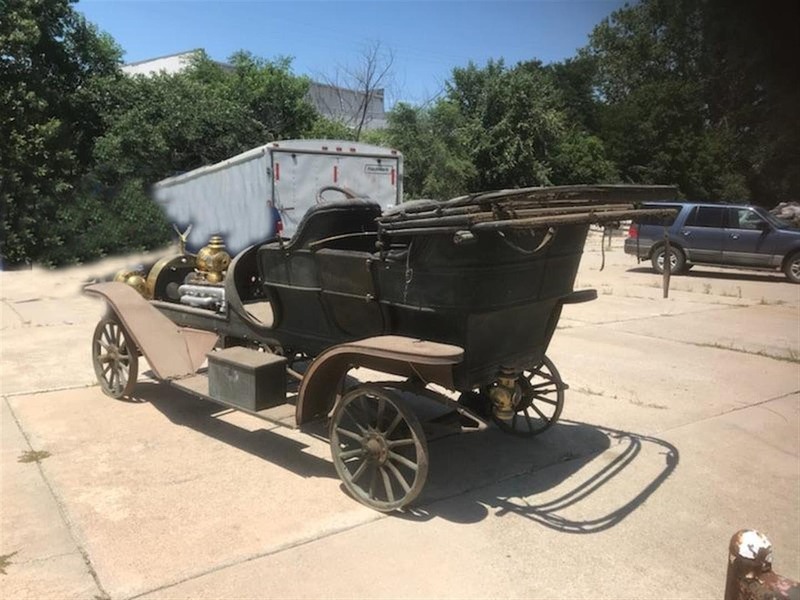 Don, I saw this in the HCCA Classifieds, I don't know if it will fit a 1908 or if you need one for your restoration or not. $700.00 for a floor mat. Figure they had to buy the forest of rubber trees....that's completely ridiculous. Maybe - Somebody with deep pockets probably needed one for their Lambert and paid to have the tooling made. 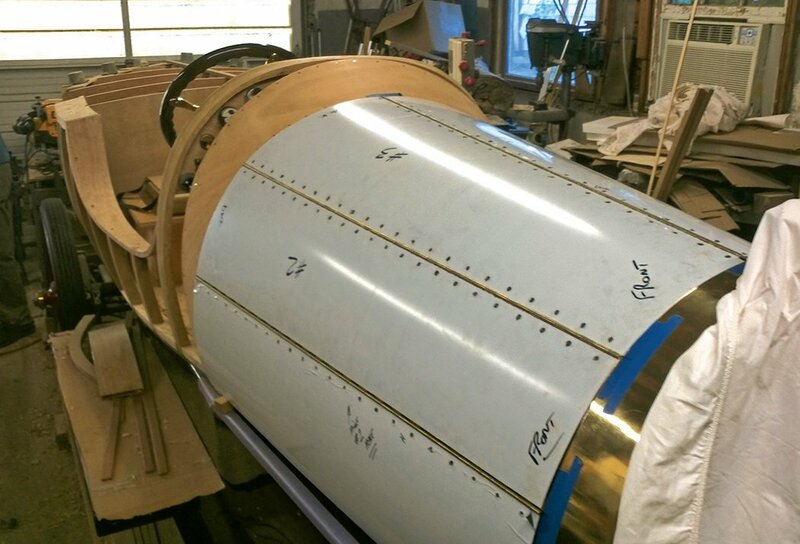 Then they figured that once they had the tooling, they might as well make four or five and try to sell the extras to recoup some or all of the tooling costs. 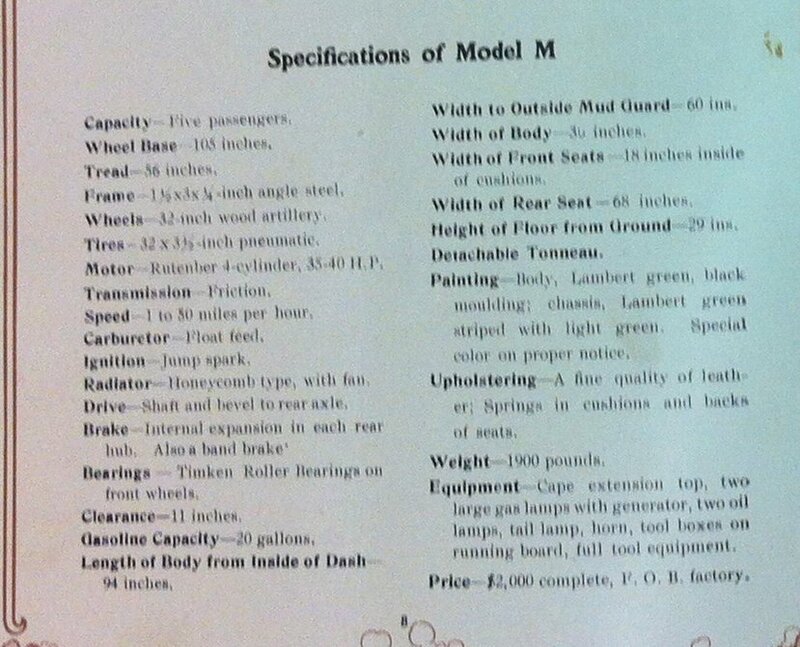 The business case for reproducing Model T parts is more favorable because of the number of cars remaining. Lamberts, not so much. Maybe one or more of our vendors can share some insight on the investment required to tool up for the reproduction products that we take for granted. 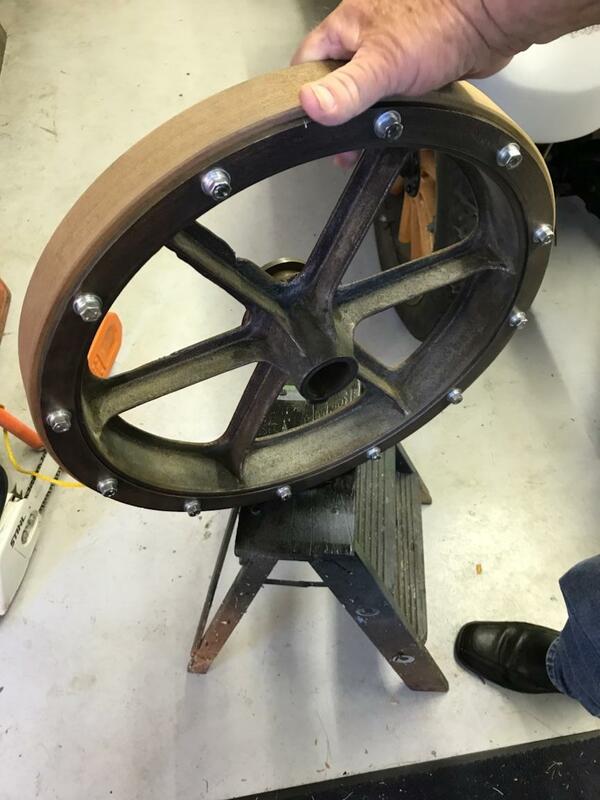 Mark, Denny Newman just had a flywheel cast for the Thomas Flyer he's working on. I can't remember exactly what he said the tooling cost but the total was around $5k or $6k. The tooling was the major expense. The only problem with this situation is there are only about 3 Thomas Flyers that exist so the odds of anyone helping bring the price down ... well...ain't gonna happen. Dink'n around with the Lambert the other day. Just had to take some more pictures of it. Note the flywheel support wheels. 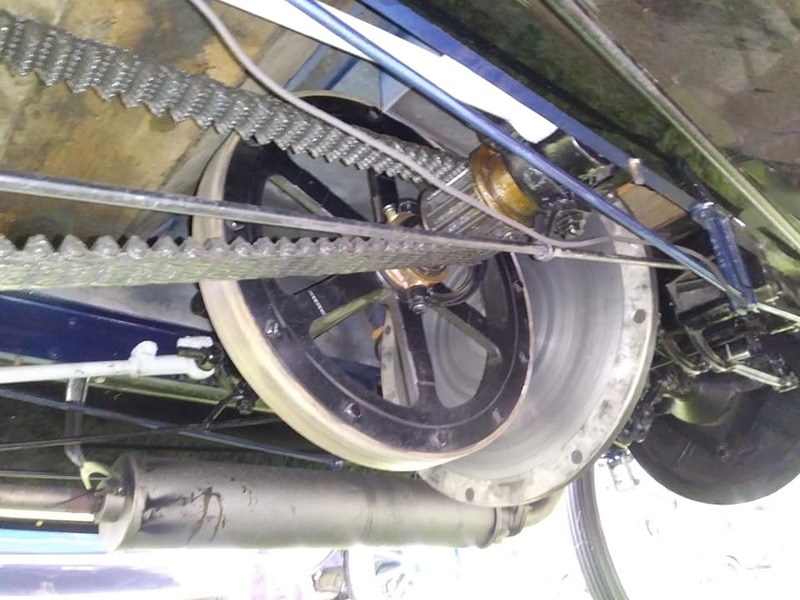 One wheel on each side of the flywheel. Denny was able to turn over the engine and it was definitely rebuilt recently. Front end now is freed up but many questions still remain as to how this thing goes together..fun stuff !! The brass era master at work. This kid knows his stuff. Thanks for the update Don. Interesting cooling system, with both input and output circulating from the top of the jugs. I wonder if the org frame was damaged and the angle iron added as a fix? Bud. This is a picture of the 07 Lambert shaft drive. 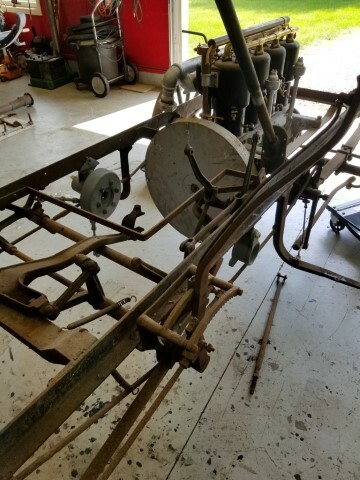 Note the cross support rods. The 08 Lambert doesn't have any holes in the frame for those rods. So they must have made a few changes along the way. The body has aprox 3"X5" inch main frame timbers that bolt into the angle iron. I would think that is the main strength for the flimsy looking chassis. Note also that the above picture doesn't show the flywheel support wheels. Yet the 08 has one on each side of the friction flywheel. Thank you Don B for the update! 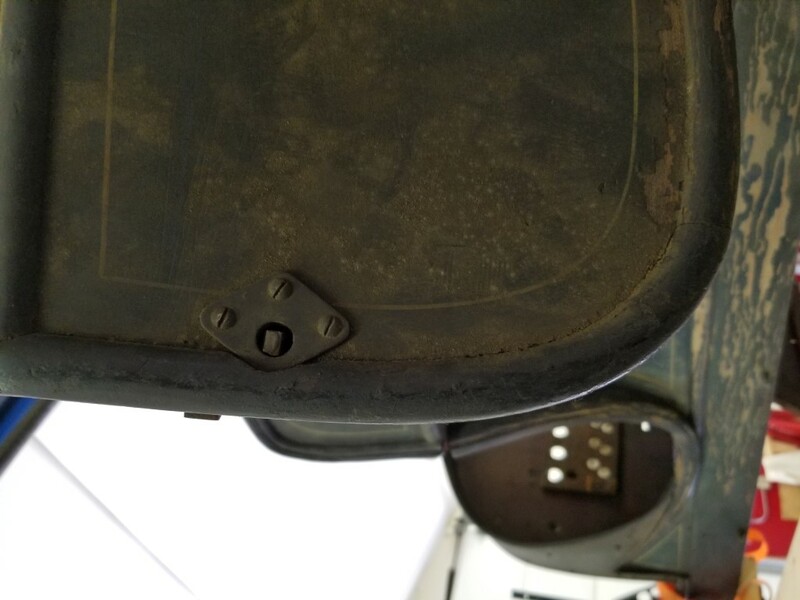 The door handles are the same as used on the REO touring of similar vintage. I've got the same on my '10 Demi-tonneau. 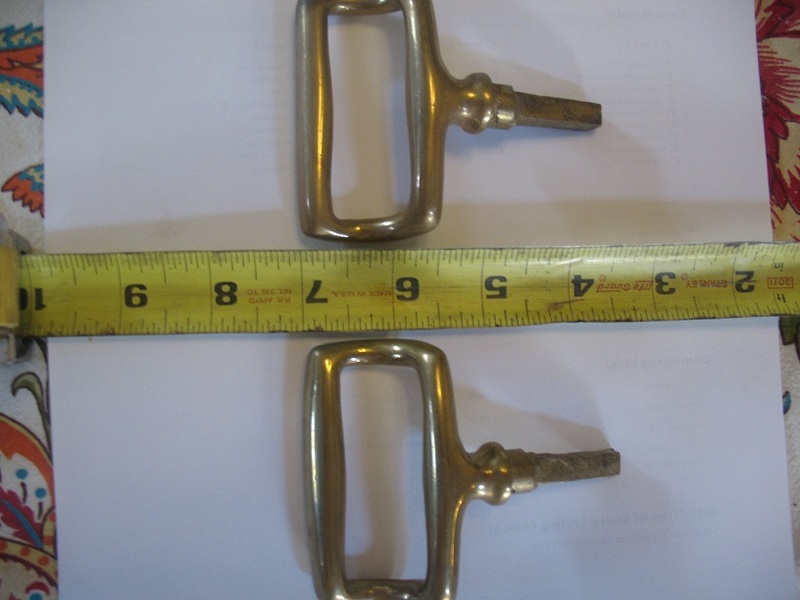 We are still in need of the correct handles in case anyone has some for sale. Thanks !! I have seen this car in person but just the body on the lift and all I can say is WOW! My wife and I both fell in love with it at first sight. Had we seen the rest of the car we might have just moved in with it but the owner might get tired of us. The original paint on that wood body is awesome to see and it would be hard to decide to restore it or keep it as is. I know I would hate to be the one to decide. What a wonderful rare car it is. Hi Bob, yes it will be a tough decision. 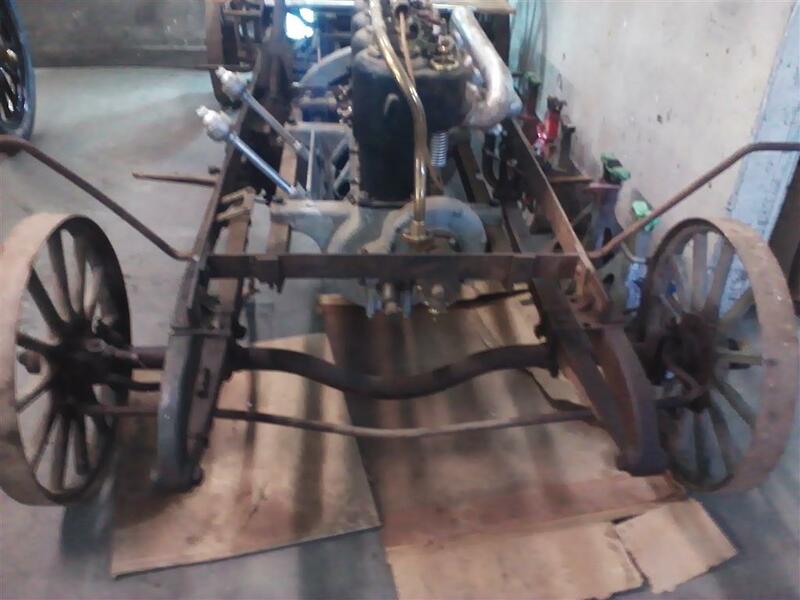 The plan for now is to rebuild the chassis, get it running and driving and then decide on the rest. I can see both sides to the restoration and would hate to be the one to have say which way to go. This is going to be a long term project either way. There may be some custom casting needed to replace broken parts. But it will get done and Mr Newman only does it the right way... I got your PM and will certainly pass on the message.